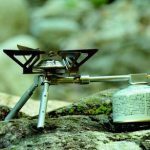 The MSR MicroRocket is very well built, offers sturdy support for 2-liter pots and has the fastest average boil time and best wind performance among stoves tested in this category. You can’t go wrong with buying this stove but you can get similar performance for less money with the Olicamp Kinetic Ultra Titanium. I can’t in good conscious call 2.6 ounces “heavy.” However, this is the heaviest of the three stoves tested in this category. Nevertheless, this thing is a serious torch. The flame is narrow and targeted at the center of the pot but its power gets things done faster than both the Olicamp Kinetic Ultra and Snow Peak LiteMax. The MicroRocket boiled 8 liters of water on 4 ounces of Snow Peak Giga Power fuel, an isobutane-propane concoction. The Kinetic Ultra also boiled 8 liters while Snow Peak’s LiteMax boiled 7. The MSR MicroRocket has the fastest average boil time among the stoves tested. Using 1 liter of tap water in a 2.4 liter MSR Alpinist 2 pot, the MicroRocket averaged 5:35 over 8 consecutive boils. The first boil took only 3:54, your benchmark time if only boiling one liter at a time. The Olicamp Kinetic Ultra Titanium averaged 5:43 over 8 consecutive boils and the LiteMax, 6:30. In cold weather with lower fuel pressure, the MSR MicroRocket averaged 2:12 to boil 2 cups of water three times, the fastest of the group. The Kinetic Ultra averaged 2:46 and the LiteMax came in at 3:28. The MSR MicroRocket’s average boil time for 2 cups of water in winds of 8 mph was 1:56. Gusts reached 10 mph during testing. The Olicamp Kinetic Ultra Titanium averaged 2:27 in the same small titanium pot while the Snow Peak LiteMax did it in 2:47. 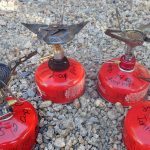 The MSR MicroRocket is the heaviest stove in this test group at 2.5 ounces. Don’t hurt your back. The MicroRocket supports rotate inward and collapse confidently alongside the mixer tube to create a narrow form factor for fitting into its cylindrical “hard-shell” (read: plastic) case. It’s small enough to fit just about anywhere and does offer suitable protection.